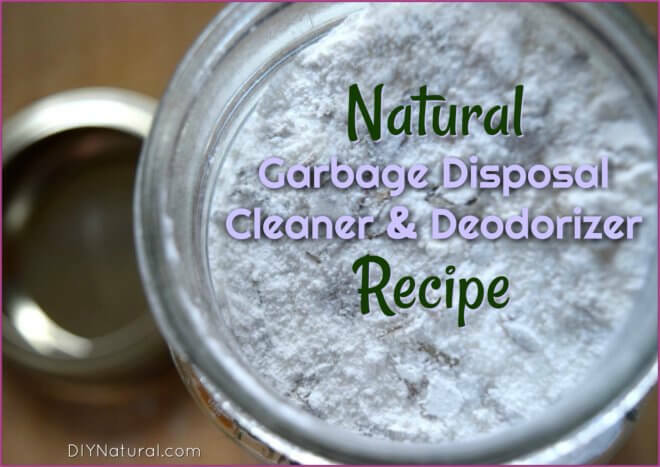 I recently created this natural garbage disposal cleaner and deodorizer recipe to freshen my stinky garbage disposal. It is all-natural and it works really well. Enjoy! I have never lived in a home with a garbage disposal until recently. For the first few months of living in our new home I completely forgot it existed. Then I realized that I could create less trash by using my garbage disposal to take care of unwanted food scraps and other small particles that normally ended up in the trash. I’ve really been enjoying using our garbage disposal until a few days ago. I noticed a very subtle stink every time I turned on the water. It took me a few days to realize that it was coming from the garbage disposal. Of course I tried cleaning it with my sprayer, then using a little soap, but nothing could eliminate the stink. I knew I had to find a natural garbage disposal cleaner, and fast. If you look online you will find lots of people telling you to throw lemons down your disposal. While this might work for some, it is important to cut the lemons up into small pieces so your garbage disposal doesn’t jam. When I tried this, my unit made a really LOUD sound, so I decided I would keep the lemon rinds out of my disposal. Plus, I rarely have fresh lemons, so I needed a solution that would be easy to make up when I needed it most. Next, I started researching things that I could not put down the garbage disposal. Lots of straight acid (like plain citric acid) can hurt or even corrode pipes. Essential oils can cause plastic to break down. Drain cleaners with bleach are no good for the environment and can cause issues in the pipes as well. After doing some testing, I finally came up with a solution that works well as a monthly maintenance deodorizer and cleaner. I find that citric acid is one of my favorite cleaners for grease and grime. It breaks up gunk and carries it away with a lovely bubbling action. I’ve used citric acid in bath bombs and other household cleaners and I even add a little bit to boost my dishwasher every once in a while. You can find it online or in the canning section of your local supermarket. Since citric acid is an acid, I added some baking soda to neutralize it slightly. Baking soda is a great deodorizer as well! Citric acid and baking soda on their own don’t have much of an odor. So I decided to add some dried eucalyptus leaves to this cleaner. The dried eucalyptus is already pretty fine and it imparts its fresh, sharp, slightly menthol aroma to this DIY cleaner. I find that the aroma stays behind and continues to deodorize even after I’ve flushed the cleaner away. NOTE: I normally add essential oils to my DIY cleaners, but I don’t like to add essential oils to this one. My garbage disposal has some plastic parts that can be harmed by prolonged use of essential oils. So I left those out this time. In a clean bowl, combine citric acid, baking soda, and eucalyptus leaves. Spoon into a mason jar and seal. Store in a cool, dry place until you need it. Add two tablespoons to your garbage disposal. Allow to sit for 30 seconds. Run garbage disposal while continuing to flush with water. I generally need to use this cleaner every two weeks, but we do use our garbage disposal a lot (two little boys… enough said!). I wouldn’t suggest using it more than monthly due to the amount of citric acid. Plus, it should really keep your disposal smelling great for quite a while! Natural Garbage Disposal Cleaner and Deodorizer was written by Katie Vance.